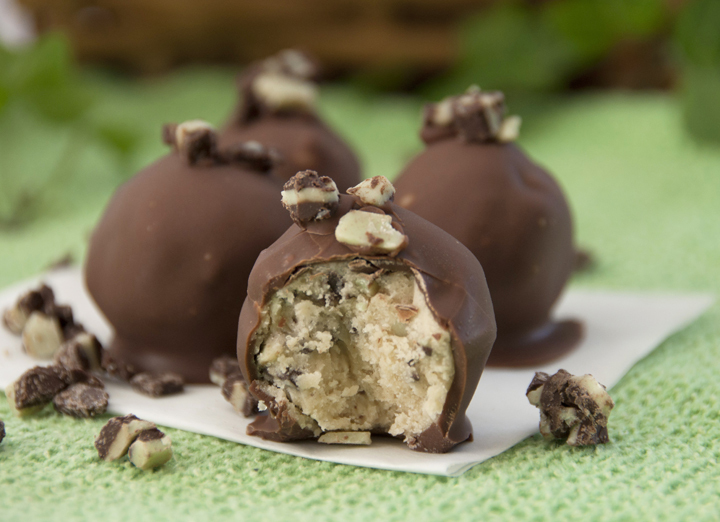 Cookie dough truffles recipe with Andes mints mixed in and covered in melted milk chocolate. A great no-bake dessert for St. Patrick's Day or Christmas. In mixer, beat cream cheese with butter until smooth. Add in sugar and vanilla and beat until smooth. Beat in flour and salt. Using a small scoop, drop onto a parchment lined baking sheet into small bites. Freeze one hour. Remove from freezer and shape each ball into a nice and round ball. Using a toothpick or spoon, dip each truffle into melted chocolate candy bark, tap side to shake off excess. Top immediately (or the chocolate will harden!) with a few small piece of Andes candy. Allow to set, about 30 minutes before eating. Store in the 'fridge and eat cool or let them come to room temperature before serving, depending on preference.